Hanoi (VNS/VNA) - Vietnamese taekwondo athletes pocketed three bronze medals at the Chinese Taipei’s Summer Universiade on August 21. In the women’s team poomsae (performance) category, Vietnam’s Chau Tuyet Van, Nguyen Thi Le Kim and Ngo Thi Thuy Dung grabbed 7.680 points to stand third. Chinese Taipei had the same points but were announced the silver medallists. The Republic of Korea were on top with 7.900 points. In the men’s team poomsae, the trio of Nguyen Thien Phung, Ho Thanh Phong and Hua Van Huy finished third, together with Iran, with 7.570 points. The Republic of Korea won the gold with 7.860 points. Chinese Taipei were second with 7.578 points. In the mixed pair event, Van and Phung could not overcome athletes from the host country and the Republic of Korea, who placed first and second, respectively. The taekwondo athletes wrapped up their tournament in two days with one gold for Le Kim in the women’s individual poomsae and three bronzes. 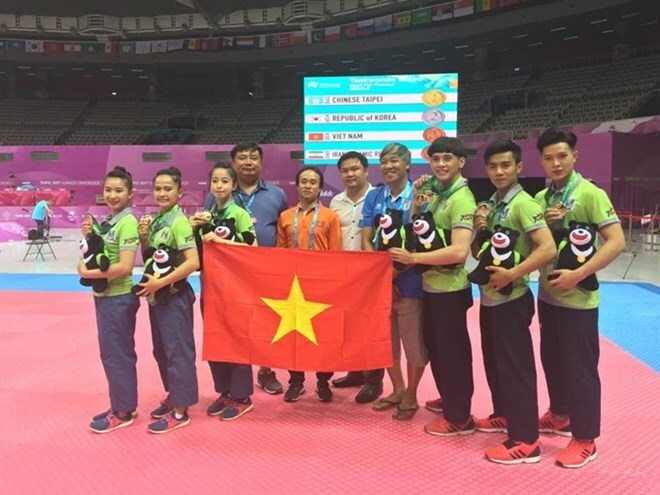 According to coach Nguyen Thanh Huy, the performances were unexpected and the best result of Vietnamese students at the Universiade, so far. Vietnam have participated in the world’s largest sports event for students since 1979, but it is the first time the team have won a gold. Previously, they bagged a bronze in taekwondo in Thailand in 2007. Since then, the delegation has won medals at all editions of the tournament but never a gold. In Taipei, Vietnam currently rank 15 among more than 110 countries. the Republic of Korea lead with 10 golds, followed by the Democratic People’s Republic of Korea and the hosts.